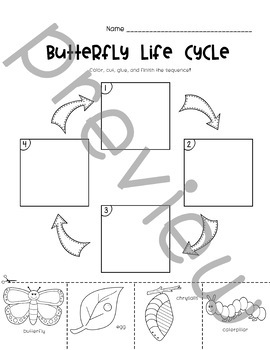 Butterfly coloring pages, butterfly life cycle, directed drawing, journal page, and printable templates! 10 pages included! Use during your Hungry Caterpillar unit, butterfly study, or spring theme! 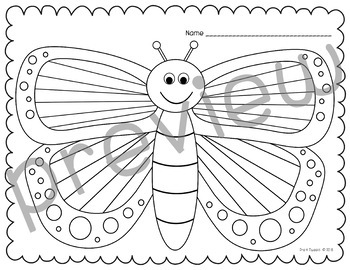 Butterfly coloring page - Striped and dotted large butterfly! Have students practice symmetry and use as pretty spring bulletin board display! Journal page - Space provided for students to draw where they would fly if they were a butterfly! To the moon? Over the ocean? They decide! Directed drawing - Students follow the simple steps to learn and draw a butterfly! Butterfly Count game - Students can play with a partner and roll, count, and color butterflies! This game can also be used with mini erasers! Mini butterflies - Prints 8 butterflies on a page. Use for graphing, bulletin board displays, and classroom activities! 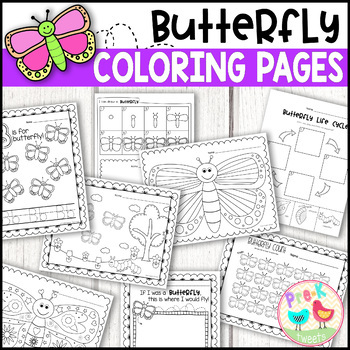 B is for butterfly coloring page - Butterflies and letter B can be colored. There is also letter Bb tracing for handwriting practice! Butterfly garden page - Has three butterflies, flowers, tree and a caterpillar! Decorative butterfly coloring page - Large butterfly filled with hearts, flowers, and tons of doodles to color. Great time filler! 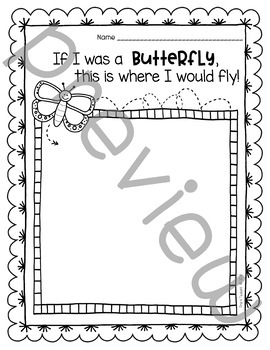 Blank butterfly coloring page - Students can get creative and design their own doodles on the butterfly! Also, can use for a lesson on symmetry! *These files are for personal and classroom use only. If you plan to share this file with others, please buy additional licenses. Thank you and enjoy!